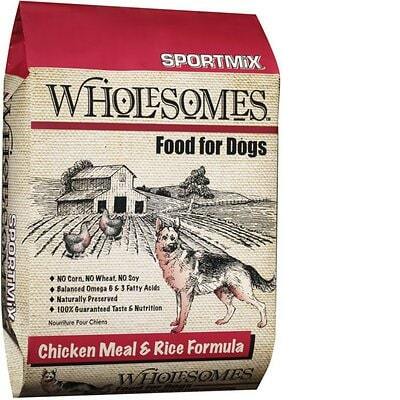 SPORTMiX Wholesomes Chicken Meal & Rice Formula is a low-priced with exceptional quality. This product has no controversial ingredients, including no artificial preservatives, colors or flavors. It has a somewhat high amount of carbs, compared to its protein and fat content, but the meat and fat quality in the food is excellent. SPORTMiX has a below-average number of recalls and was very transparent when answering our questions. Watchdog Labs highly recommends this product. Chicken Meal, Brown Rice, Rice Flour, Rice Bran, Chicken Fat (Preserved with Mixed Tocopherols), Dried Beet Pulp, Flaxseed, Dried Egg Product, Potassium Chloride, Salt, Choline Chloride, Dl-Methionine, Vitamin A Supplement, Vitamin D3 Supplement, Vitamin E Supplement, Zinc Sulfate, Ferrous Sulfate, Niacin, Calcium Pantothenate, Riboflavin Supplement, Copper sulfate, Pyridoxine Hydrochloride, Thiamine Mononitrate, Manganese Sulfate, Zinc Proteinate, Manganese Proteinate, Copper Proteinate, Calcium Iodate, Cobalt Carbonate, Folic Acid, Sodium Selenite, Biotin, Vitamin B12 Supplement. The average dog food we reviewed has 39 total ingredients, with 1 controversial ingredient. This food has 0 total controversial ingredients, excellent! Brown rice is whole-grain rice with the inedible outer hull removed. It provides calories, complex carbohydrates and a few other nutrients to dogs. We generally consider it a quality dog food ingredient. Rice flour provides calories, complex carbohydrates and a few other nutrients to dogs. We generally consider it a quality dog food ingredient. Rice bran are the hard outer layers of rice. It provides calories, fiber, carbohydrates and a few other nutrients. We generally consider it a quality dog food ingredient. Chicken fat is the fat left over after cooking chicken parts. It's a high-quality dog food ingredient that provides nutrients such as fat and Omega-6 fatty acids. We did not find a single controversial ingredient in this food, this is how it should be. This dog food is made in the USA - that’s fantastic, because of the high food manufacturing rules and regulations here. Chicken Meal and Chicken Fat are the major meat and fat sources in this product. Both clearly show which animal they come from, very good and transparent. SPORTMiX Wholesomes Chicken Meal & Rice Formula has 0 controversial artificial preservatives, excellent. It’s good to know that ‍not all artificial preservatives are bad. That’s because they serve an important purpose, which is to prevent food from spoiling. However, we consider 11 artificial preservatives controversial because of their potential link to cancer and other serious health conditions. SPORTMiX has a below-average number of recalls. SportMix is owned by Midwestern Pet Foods (Nunn Milling Company) and they responded to the first email in the first day, which is exceptional. It did require a series of back and forth emails to obtain the clarity in the emails below. Our board-certified nutritionist (who is an independent contractor for our company) formulates our formulas. He has a Ph.D., P.A.S., D.A.C.A.N., C.N.S, P.F.S., and 38 years’ experience developing multiple major food & treat brands. We follow AAFCO nutritional profiles and follow these nutritional tests with digestive and palatability studies to confirm efficacy of the products. All of our formulas which are designed to provide complete and balanced nutrition, meet all AAFCO nutritional requirements. We do complete feeding trials when new formulas are released. When checking the label, it would seem some products do not have the feeding trials completed. It could be assumed that the representative was suggesting that all new products go through the trials. All of our dry kibbles and treats are manufactured in our company owned manufacturing facilities in Monmouth Illinois, Waverly New York, Chickasha Oklahoma, and Evansville IN. Our plant(s) can be visited upon written request and subject availability. Midwestern Pet Foods has quality control personnel and laboratories at each plant to test incoming ingredients and finished products. This ranges from managing guarantees, to testing things like degree of cook and microbial confirmation for release. All of our plants are FSMA-ready and follow the GMP regulations as put out through FSMA and the FDA. Additionally, all of our safety technicians follow all OSHA and state regulations. We source all ingredients from US suppliers if ingredients are available, grown or produced in the US. All ingredients in Earthborn Holistic dry pet food are grown or produced in the US except for lamb meal which comes from Australia or New Zealand, tapioca which comes from Vietnam and Thailand, flaxseed which comes from Canada and krill meal which comes from Antarctica. Our products and ingredients are ethoxyquin-free. Our vitamin premixes are formulated, sourced and blended in the United States by a US company in a human grade facility. Certain subparts of the vitamin premixes are only available overseas. Our US supplier assures us that they make every effort to source from reputable non-Chinese vendors. All these ingredients are thoroughly tested and undergo many quality checks to insure safety and that specifications are met. But even with these checks in place, it is difficult if not impossible to say that some subpart of some vitamin ingredient may originate in China. We feel that it is unethical to claim, like some manufacturers do, that even though our vitamins and minerals are formulated, sourced and blended by a US company in the United States that there could not be a trace or subpart of a vitamin that comes from China. We at Midwestern Pet Foods strive to provide correct, truthful information. This was one of the most complete answers received for this question. Other company responses also reference the misnaming of Chinese sourced ingredients and the loopholes that are exist.